Introduction: Except for interruptions caused by undersea earthquakes or damage from ship anchors and fishing trawls, submarine cables are extremely reliable. They have to be, as the cost of a repair expedition can be hundreds of thousands of dollars. There are many factors which ensure that a cable, once successfully laid, will need little attention for its twenty-year life; an important one is the choice of route. The bed of the ocean is very much like the surface of the earth, with mountains, valleys, and plateaus. The ideal path for a cable would be flat and level for its entire span, but this is never the case, especially with long cables. A considerable amount of planning goes into choosing a suitable route, beginning with a hydrographic survey of the ocean floor in the general area of the proposed path. This page on the 1973 BRACAN cable, based on material provided by survey engineer John Holmes, will give an idea of the work involved. Once the survey has been completed the documentation begins. Every aspect of a cable project, from the survey to the laying, is carefully documented, so that in the event of a repair being needed, perhaps years after the cable was laid, all necessary information is available. This all starts with the drawings of the cable route or “corridor”, based on the survey results and the expert opinions of the cable company’s hydrographers. 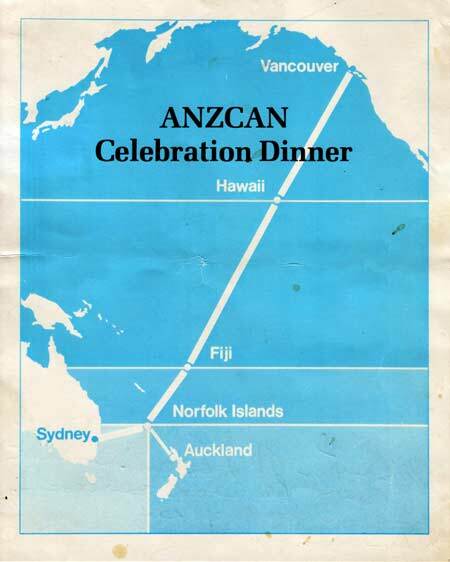 Here Karl Howard tells the story of his work on these documents for the ANZCAN cable, laid between 1982 and 1984 from Australia and New Zealand to Canada. Karl has included much interesting detail of the work and methods of a precision drawing office of just thirty years ago; all of those highly skilled operations, used by draughtsmen for hundreds of years, have now long since been completely superseded by computer graphics. I started my career in draughting in 1979, and I was very lucky to find not only a job, but one that I wanted to do, as in the UK at that time we had huge unemployment and prospects were very bleak. I was employed by Engineering Surveys Reproduction Limited, based in West Byfleet, Surrey, as a Cartographic Draughtsman. ESR was a company that dealt with many UK military and UK Government projects, which I am not able to divulge details of. It was the height of the Cold War, and it seemed at the time that we were hunkering down for a major clash with the East, and so our company was very busy with all sorts of contracts. Back in 1979 the working office was very different to the office of today. Looking back, it seems so awful - the company was, I believe, founded by ex-UK Army personnel, and was run in a very strict manner. We all worked very hard (we had to!) and we also had to keep our work at a very high standard, in a time of great competition. I learned many good sound lessons while I worked there, and have continued to work to these principles. West Byfleet is a small town about 25 miles west of London. There was a main rail link into London, and the new M25 orbital road was being built in the area, so ESR was a very well located company. We had a Survey Department, a Drawing Office and a Reprographics Department, and we always seemed to be very busy indeed. I worked in the Drawing Office, which had around 30 or so other employees. My section dealt with the actual draughting of work - there were no computers so everything was done by hand. We used old drawing pens with little split nibs (like a quill); you dropped a small amount of ink onto the nib, cleaned it, then started to draw...refilling every few minutes or so. We used only these pens and nibs as the quality was so high. Even to draw dashed lines it was old school, all by eye and hand, with French curves used to draw around circles, etc. I remember a large selection of wooden curves, “Railway Curves”, used to get those parallel lines. It’s amazing now to think how old-fashioned we were! We used to draw on plastic sheets, and I even had to make some drawings on linen. Gosh, those were Dickensian times! To draw contours we used a device called a Cartograph, a stainless steel tripod with each leg having a ball bearing to give it free movement. The apex had a small swivel head that housed a split nib, as with the drawing pens. To draw a contour you followed your surveyor’s guide under the plastic with a smooth dragging movement. It was essential to have a smooth contour line; the test was to look along a contour you had drawn, and if it had no kinks then it was good. If not, you had to rub it out, and start over again. All the annotations were done using a Leroy lettering stencil. This was aligned to the drawing using a set square and controlled with the left hand. The right hand then operated a device that traced around a letter of the stencil, and with a small ink pen transferred the letter to the drawing. It took ages, one letter at a time! You can see that draughting at that time was very labour intensive, and to a degree a real skill. I would be drawing maps one day, building surveys the next, exhibitions another, a great variety of work. I also did some scribing—that was the other side of the office— using a device like the Cartograph, but using ruby-tipped crystals of varying sizes to scrape away the red area of masking film to prepare work for printing, a very time-consuming process. The route of the cable was from Sydney over to Lord Howe Island, and on to Norfolk Island (12 June 1981). From here a branch ran to Auckland, New Zealand (5 June 1981). The main cable corridor then continued from Norfolk Island up to Fiji (16 June 1981), on towards the Tokelau Islands (17 September 1981) then over towards Fanning Island, and north up to Hawaii, I believe between Kauai and Oahu (20 September 1981). The final leg was to Vancouver Island (23 October 1981) and up Juan de Fuca Strait to its termination at Victoria, British Columbia. This was a huge job for me and my colleagues, far from the cable route in our warm, dry office in leafy Surrey! It involved six months of constant work, drawing the whole of the seabed, the islands, atolls and coral reefs. It was an amazing experience and a joy to work on—I never again had such a thrill as I did in contributing to this huge project. As a young person just starting out in work the task was very daunting, but also very exciting! Sadly, just after the end of the project I had a very serious motorbike crash and I was kept away from work for over 6 months. I lost contact and did not know the final outcome of all this work until discovering the ANZCAN pages on the Atlantic Cable website. I left ESR Ltd in 1982, and in 1983 went to work for the French oil company, Total, in Aberdeen, Scotland, where I became Senior Draughtsman. Over the years there I worked on many huge projects in the quest for oil and gas—the contour maps were a breeze for me, having done my “greenhorn” bit back in the ANZCAN days—but never in my 13 years at Total did I ever work on such an exciting and special project as ANZCAN. I now live in Jersey, one of the Channel Islands, just off the coast of Northern France. Purely by chance, the beach that I love the most has just beneath its surface two large electricity cables that link us to France, some 14 miles away. I often think that perhaps the technology and experience of the ANZCAN line was similar to that used on these cables...and I wish I could just draft one more time the seabed over to France! See also David Watson’s story of the laying of ANZCAN, and this page on the commemorative medal issued to cable company staff who worked on the project.